Pick up from Hotel and Depart to Uttarkashi surface approx. 190 kms/ 7 hrs. En route visit Rishikesh Temples, Ashrams and Laxman Jhula. Evening reach Uttarkashi and check inn at hotel. Overnight at hotel. After breakfast 100 kms drive to Gangotri. On arrival check inn at hotel. Later you can take a holy dip in the sacred river Ganges, also called Bhagirathi at its origin. Perform Pooja after that and relax for some time in the lovely surroundings. Overnight at hotel. Morning drive to Sringar by surface approx 245 kms/ 8 hrs. On arrival chekc inn at hotel. Overnight stay at Hotel. Optional. Morning drive to Guptkashi by surfac eapprox 80 kms/3 hrs . En route do Karnaprayag & Rudraprayag sightseeing. On arrival Guptkashi check in at hotel. Evening visit Kashi Vishwnath and Ardh Narishwar Mandir. Overnight stay at Hotel. After breakfast leave for Phata to take Helicopter for Kedarnath Ji. On arrival freshening up, perform Pooja and also Darshan at Shri Kedarnathji. In the evening also visit Adi Shankaracharya Samadhi behind the temple. Overnight stay at Kedarnath Ji. After breakfast depart to Helicopter Point by self and take helicopeter for Return to Phata. Reach Phata our vehicle will picked you and depart to Joshimath 180 kms. Evening reach Joshimath & check in at hotel. Overnight at hotel. 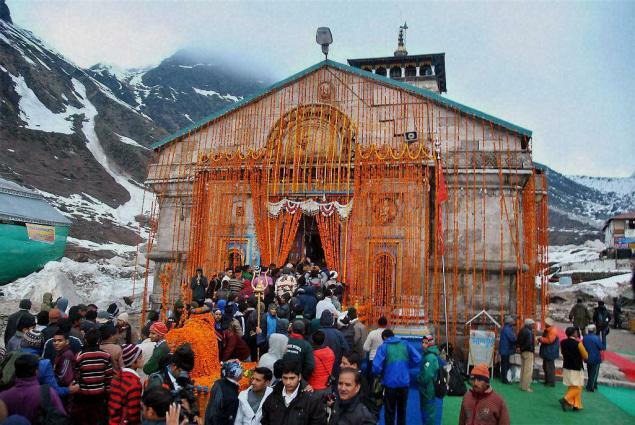 Optional- Joshimath sightseeing. After breakfast depart for Badrinath 60 kms. Check inn Badrinath Hotel and Night in Badrinath. Today full day exertion to Badrinath Ji. Take the holy Darshan and spend time visiting Mana village -the last village before the Tibetan border. Return to the hotel for dinner. Overnight stay at Badrinath. After breakfast leave for Rishikesh by surface approx. 290 kms. On the way stop for lunch at Srinagar. Continue the journey and if time permits, visit Devprayag ( The confluence of rivers Alaknanda and Bhagirathi, which become the Ganga). Reach Rishikesh. Check in Hotel. Evening visit Laxamn Jhula and Ram Jhula and see the evening arati. Overnight stay at hotel. After breakfast leave for Haridwar by surface approx. 160 kms. On the way stop for lunch at Srinagar. Continue the journey and if time permits, visit Devprayag ( The confluence of rivers Alaknanda and Bhagirathi, which become the Ganga). Transfer to Haridwar and Hotel Self.